The definitive pencil puzzle app -- created by Nikoli! A new app with popular Nikoli puzzles, from the originator of SUDOKU fever. Join our deep and warm pencil puzzle world. The application has 3 kinds of puzzles at present. The puzzles here are unique and the enjoyably original. We have worked hard to develop the application with an original iPhone-like interface. Solving the puzzles goes smoothly and pleasantly. Enjoy these puzzles in the app format on the iPhone. You can purchase and add problem collections that contain dozens of puzzles at the App Store, via the "Puzzle by Nikoli" application. Try out the free sample problems there. If you like these original Nikoli puzzles, we are confident you will also enjoy the problem collections you add. You divide the board into small boxes, cheerfully rhythmically snipping and slicing as you go along. Put light bulbs to illuminate all white areas. The rules are simple, but let you into the logic of a complex world. Fill in cells to build a black continuous wall. Watch and marvel at the wall snaking and stretching and feel a real sense of achievement. "Sudoku by Nikoli" is the application by Nikoli, the origin of SUDOKU fever. "Sudoku by Nikoli" contains 9 free sample problems. You can purchase and add problem collections that contain dozens of Sudoku puzzles at the App Store, via the "Sudoku by Nikoli" application. Please try out the free sample problems. If you like these original Nikoli Sudoku puzzles, we are confident you will also enjoy the new problem collections you add. The problem collections are categorized by difficulty (easy, medium, and hard) on the purchasing pages. When you add a new problem collection, it is simple to choose your favorite difficulty level of Sudoku puzzles. 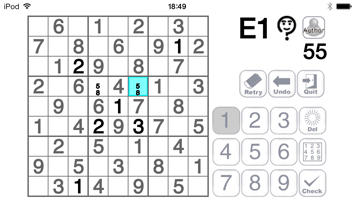 We keep publishing new problem collections, so you can continue enjoying our well polished finely tuned Sudoku puzzles as often as you wish. Please contact us using the email form at the "Inquiries about app page." The first puzzle magazine in Japan was published in August, 1980, this magazine was "Nikoli." So, yes, we are the pioneers in this field in Japan. Nikoli is now the company "NIKOLI Co., Ltd.". We publish a wide variety of puzzle books and magazines, and also supply original puzzles for newspapers, magazines, and video games. The Nikoli internet site is "nikoli.com" where you can play 12 different kinds of puzzles on your computer. Please visit "nikoli.com" and enjoy our original puzzles.